Property Size 780 sq. 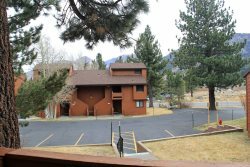 ft.
Standard One Bedroom and One Bath condominium located walking distance to the Canyon Lodge Ski Lift Area in Mammoth Lakes. Sleeps up to 5. One Queen bed in the bedroom & one queen foldout couch and one single fold out in the living room. Two TV`s 1 large flat screen in the living room and 1 small TV in the bedroom, VCR, stereo. Phone in unit 760-934-1523 (780 sq. ft.) WIFI PROVIDED IN UNIT. The unit is all one level and you enter from an interior hallway in the Chamonix D Building. There is one outdoor parking space available. Chamonix Recreation room with large screen TV, reading area, ping pong, foosball, and business center with fax, copier, computers w/ internet and laptop hook-up. Sauna, hydro spas, seasonal/summer swimming pool & BBQ area. Coin-operated laundry facilities located in the common area near the office. COMPLIMENTARY INTERNET and CABLE TV are provided, however NO REFUNDS will be given for connectivity problems or Internet failure. TOT LICENSE 1968-CX77. It was a nice experience will definitely come back again!! Walk to canyon lodge. The location is super. Will try to stay here again next time. Excellent location! Furniture outdated. Management company was very responsive, much appreciated! Walking distance to Canyon Lodge and less than a mile from the downtown restaurant area. Hard to beat the location. Its about a building or two from the entrance of the Canyon Lodge parking lot. An easy walk to Canyon Lodge to and from the room. Priced very fair considering the space and location, IMO. The accommodations were very comfortable and cozy with an eclectic mountain cabin decor. 4-5 people would be very comfortable. Everything was in place and clean upon arrival. Also received a nice phone call with the owner to make sure everything was as expected. Finding the Chamonix Condos was easy and straight forward. However, we did have some difficulty locating the specific lobby that housed our key because everything was covered in snow. FYI, the lobby for our key was off the main road Canyon and not on a street turn off of Canyon. We had to call the number provided on the reservation and also asked one of the friendly people in the area. From that point on its pretty straight forward using the instructions provided in the email confirmation. My husband and I stayed in this cozy little cabin for our weekend snowboarding getaway. The location couldnt be more perfect. 3 minute walk to Canyon Lodge. Quick drive to the Village. The cabin itself was comfortable, well-stocked and well-heated. Its not fancy by any means, but for the price and location and comfort, we were very, very happy guests. Great location! Just a short walk to the lifts! Nice and quiet place. Will come again. Continue aprox. 1 mile up Canyon Blvd. the Canyon Lodge Parking Lot.